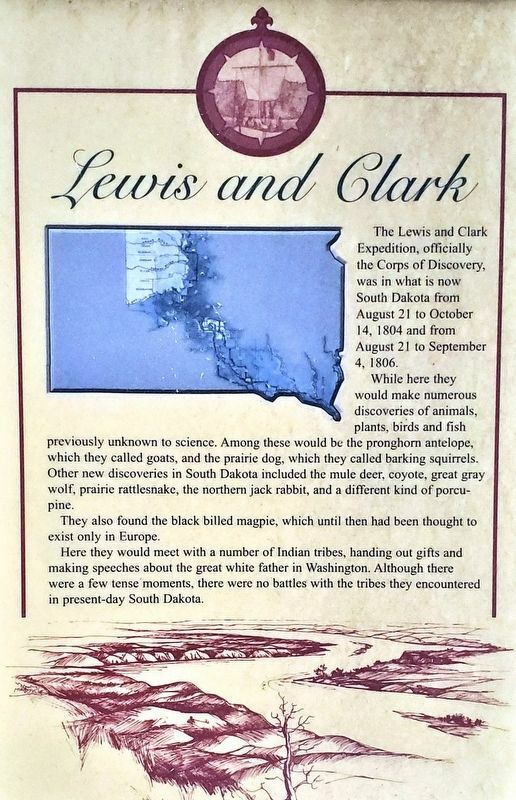 The Lewis and Clark Expedition, officially the Corps of Discovery, was in what is now South Dakota from August 21 to October 14, 1804 and from August 21 to September 4, 1806. While here they would make numerous discoveries of animals, plants, birds and fish previously unknown to science. Among these would be the pronghorn antelope, which they called goats, and the prairie dog, which they called barking squirrels. Other new discoveries in South Dakota included the mule deer, coyote, great gray wolf, prairie rattlesnake, the northern jack rabbit, and a different kind of porcupine. They also found the black billed magpie, which until then had been thought to exist only in Europe. Here they would meet with a number of Indian tribes, handing out gifts and making speeches about the great white father in Washington. Although there were a few tense moments, there were no battles with the tribes they encountered in present-day South Dakota. Erected by Lewis and Clark National Historical Trail, National Park Service. is included in the Lewis & Clark Expedition marker series. Location. 44° 22.278′ N, 100° 21.844′ W. Marker is in Pierre, South Dakota, in Hughes County. Marker is at the intersection of West Dakota Avenue and James Street, on the left when traveling south on West Dakota Avenue. Touch for map. Marker is located beside the sidewalk, directly in front of the Pierre Chamber of Commerce building. Marker is at or near this postal address: 800 West Dakota Avenue, Pierre SD 57501, United States of America. Touch for directions. Other nearby markers. At least 8 other markers are within walking distance of this marker. Pierre (here, next to this marker); Pierre's First School (within shouting distance of this marker); Old Deadwood Trail (approx. 0.4 miles away); John C. Waldron (approx. 0.4 miles away); American Indians and the Fur Trade (approx. half a mile away); South Dakota Railroads (approx. half a mile away); John Sutherland and the Capital Fights (approx. 0.6 miles away); Pierre Was A Cowtown / Reading Brands (approx. 0.6 miles away). Touch for a list and map of all markers in Pierre. More about this marker. This is a tall, triangular, metal "kiosk-style" marker. Credits. This page was last revised on October 16, 2018. This page originally submitted on September 27, 2018, by Cosmos Mariner of Cape Canaveral, Florida. This page has been viewed 49 times since then and 8 times this year. Last updated on October 14, 2018, by Cosmos Mariner of Cape Canaveral, Florida. Photos: 1, 2, 3. submitted on September 28, 2018, by Cosmos Mariner of Cape Canaveral, Florida. • Andrew Ruppenstein was the editor who published this page.